Our last public lecture of the 2016/17 season was a special experiment: a duo talk given by Dr Anna Marie Roos from the School of History & Heritage and Dr Fabien Paillusson from the School of Mathematics and Physics. The sciences and the humanities met as Drs Paillluson and Roos each gave a short lecture about The Newtonian Moment, their presentation held in the new Sir Isaac Newton Building on the University of Lincoln’s Brayford Pool Campus. Their talk, which melded history, philosophy, and science and featured digital animations, attracted an audience of about 200 people, the largest so far in our lecture series. A successful experiment, this event was a wonderful way to honour our most famous Lincolnshire scientist and to celebrate the University of Lincoln’s commitment to scientific enterprise and innovation. I am fond of any piece of writing involving discussions on thermodynamics, statistical mechanics and entropy. I have only recently discovered the work of Arieh Ben-Naim and decided to start delving into his approach on these subjects with one of his latest books “Entropy and the Second Law, interpretation and misss-interpretationsss” published in 2012 by World Scientific. To summarise my experience: I had really joyful moments while reading some ways of presenting the material that I had never seen anywhere else but which were unfortunately mixed-up with more confusing (for me at least) passages where I would either not understand the “pedagogy” or simply disagree with the point of view emphasised by the author. There are 5 chapters in the book and I shall comment on them separately as their aims and content are somewhat different. Physics students at the University of Lincoln have been recognised at a prize giving event for their hard work and effort on the course. As the first cohort of Physics students at the University, staff thought an award ceremony at Doddington Hall would be a nice way to end the year. Christopher Dickens was awarded the special Edward Delaval award. Christopher was presented with the award by Mrs Claire Birch of Doddington Hall. Two commendations certificates were given to Hannah Thurlbeck and Robert Sharp, whilst Aaron Adams received commendation for his Physics Experimental Work. The commendations were presented to the students by Professor Toshihiro Kawakatsu from Tohoku University, Sendai, Japan, who is a member of our school’s External Advisory Board. The student-lead Physics Society even gave out their own certificate for the staff member they felt they’ve got the most out of this year. When anybody learns quantum mechanical concepts for the first time it is often hard to visualise what is really going on for a quantum particle: an object neither describable simply in term of a physical wave nor in term of classical mechanics. Now, to be clear, nobody knows what happens “really” to a quantum particle when we don’t observe it but the purpose of quantum mechanics is precisely to figure out, among other things, the likelyhood with which we can find a given quantum particle at a particular location at a particular moment in time. To model this, we use the (in)famous concept of the wave function Ψ: the mathematical object that contains all the possible information there is to know about a quantum particle and whose module squared represents the sought probability of finding a particle at a given place. The difficulty is at least two-fold for the students: 1) the wave function is an abstract genuine complex mathematical object (having a real and imaginary part) quite far from classical concepts like position and velocity and 2) it evolves according to a somewhat complicated equation called the Schrodinger equation that can only be solved by hand in rare instances. The first problem often treated in class is that of a quantum particle in a one dimensional unescapable box. The logic of the resolution can seem disconcerting at first sight: one looks at so-called stationary (quantum) wave states and, depending on the state, determine for instance the energy of the particle and its probability to be a certain point in space (the stationary character ensures that this probability does not vary in time). Now, in principle many practical questions can emerge with such an answer provided as is. Here are some of them: since there are infinitely many (countable) possible stationary states, how do we know which ones to look at for a real problem? and how do these stationary states actually come about in practice? In sum, why is it a satisfactory answer to the “particle in a 1D box” problem? Giving a full answer to these questions might take us too far but we can start understanding part of it by running a little thought experiment. Let us assume that there is a quantum particle (e.g. an atom or an electron for instance) in a box. Let us further assume that at one moment in time we were able to measure quite precisely (with an acceptable uncertainty) the x coordinate of the particle. Now here is the question? What can we say about the future of that very particle? The answer to that question is given in the video below that shows a numerical solution of the Schrodinger equation corresponding to our problem. This video contains three stages that we will discuss each one at a time. We see that the probability density to be at a position x is initially narrow and centered in the middle of the box, in agreement with the beginning of our little thought experiment. We then observe something a bit surprising: the probability density spreads like a droplet on a table. Why is that? Here we need to recall that one cannot know accurately both the position and the momentum of a quantum particle. This is the celebrated Heisenberg indeterminacy principle Δx . Δp > h/4Π . What it means is that the more accurately we know the position of an object the less accurately we know its linear momentum/velocity. Since we start in a situation where the position is quite well known, it follows that the momentum is very uncertain. The wave function from the outset thus reads as a superposition of wave functions (a wave packet), each associated to a different definite momentum. In the video this is represented with the particular coloring of the probability curve itself. A color corresponding to a positive (resp. negative) value signifies that this part of the curve wants to go to the right (resp. left). In the jargon of quantum mechanics, this is quantatively described by an object called the probability current j. Basically, if the probability is p = Ψ*.Ψ , then the probability current is given by j ∝ h Im(Ψ*. ∇ Ψ). The net effect is that different parts of the probability function go at different “velocities” and this basically stretches out its shape exactly like when we stretch a pizza dough by pulling on two ends with opposite velocities. In the remaining part of the video, we see that the wave packet reaches the walls of the box and starts interfering with itself thus creating regular spatial patterns with crests and troughs. This is where it becomes interesting to us: what we see is that the probability density cycles through various standing wave patterns (those known by every student starting a course in quantum mechanics). So, what it shows is that, in any real setup, a particle in a box is bound to explore in various ways a set of fixed patterns which are the standing waves we learn in school and that is the reason why they are important. We can go a little bit further in our quest for understanding the quantum behaviour of a particle in a box. To this end, let us imagine that we were in fact able to measure quite accurately both the x and y coordinates of the particle but also that the particle has a non-zero momentum (this is fine so long as Heinseberg principle is satisfied). The corresponding probability density is expected to evolve in a fashion demonstrated by the following video. This video shows all the features we have seen in the one dimensional case: 1) an initially localised probability density, 2) spreading in the whole box after some time and 3) self-interference upon interacting with the walls that leads to a fully delocalised probability distribution that cycles through fixed standing wave patterns. There is one additional aspect to this video owing to the fact that the particle is now moving in the box: during the first “bounces of the particle on the walls”, the (probability density of the) particle seems to behave almost like a classical particle; in fact the simple fact that we can even talk about “bounces” betrays the fact that the particle does behave a bit like ping-pong ball for some amount of time. It is not too difficult to understand what is going on. If we start with an initial uncertainty Δp0, then in the long run the rim of the wave packet will expand roughly at a rate Δp0/m. After a time t has elapsed the extansion of the wave packet will have increased by an amount (Δp0/m)t. To put the final touch, we use again Heisenberg relation to infer that Δp0 ~ h/Δx0. So that we get that the size of the wave packet increases as ht/(m Δx0). Imagine a hydrogen atom of mass 10-27 kg of which we know the position with the precision of 1 pm (one hundredth of its size). Even, if we don’t do anything to it, within 10 microseconds the uncertainty on its position will be of the order of a metre; at that stage we cannot talk anymore in classical terms about it at all since the particle can literally be anywhere in a radius of one metre. Imagine now a pebble on the floor. Let’s assume its mass is 100 g and we know its position to the angstrom. The time we would have to wait for the quantum uncertainty on its position to be 1 metre would amount to 1023 seconds; it is a bigger number than the number of seconds elapsed since the estimated time of the Big Bang! So, effectively we don’t need quantum mechanics to help us understand the whereabouts of a pebble but it becomes very fast the only tool to describe much lighter objects like elementary particles and atoms. For a long long time I thought that concrete hardened because it dried out. Then, in 2011 I attended a conference on Strongly Coupled Coulomb Systems in Budapest where one of the speakers actually explained that concrete did not harden because it dried out but essentially because it wet. Needless to say, I felt incredibly ignorant at that very moment and also very surprised. Since then, each time I had the opportunity, I would tease fellow colleagues with the same misbeliefs I once had on the matter by telling them that concrete actually becomes harder as we pour more water in it (to some extent at least). Luckily, in this internet age, these discussions are not restricted anymore to people making a living of trying to understand the world and a lot of very interesting and educational videos can be found all over the web and on Youtube in particular. Few days ago, MinutePhysics posted a video explaining the hardening process of concrete and debunking most misconceptions on the subject in less than 2 minutes. Now if you would like to know more on the subject the wikipedia page on concrete curing is very well documented and accessible to a wide readership. On 25th of November 2015, exactly 100 years had passed since Einstein presented his General theory of Relativity to the Prussian Academy of Sciences. His new theory was ground breaking in many ways and changed our apprehension of space and time in a definite manner. It went even further by proposing that gravity, the force that holds the solar system together in Newton’s theory, was nothing but space-time itself; the twist being that matter itself (or in fact energy) can bend and warp space-time. Despite having been successfully confronted to experiments almost right away, the Theory of General Relativity has still, to this day, difficulties to permeate the popular spheres and is in fact not necessarily taught in physics curricula in Universities. The main reasons are (a) the predicted deviations from Newtonian physics are very small on Earth, (b) its (somewhat rebutting) mathematical complexity involving (pseudo-) Riemannian geometry and (c) its non intuitive and mind bending predictions very difficult to apprehend without writing equations. It is often said indeed that one cannot understand General Relativity without an extensive use of Mathematics. Yet, the recent movie Interstellar did an excellent job in picturing what it would mean to travel in a world where the predictions of General Relativity matter and enthusiast theoretical physicists such as Brain Cox or Brian Greene contribute too to very simply picturing the new kind of narrative offered by Einstein’s theory. So there is hope that we won’t have to wait the 200th anniversary of Einstein’s presentation of his theory for General Relativity to finally get its well deserved acknowledgement by the public and mainstream education. 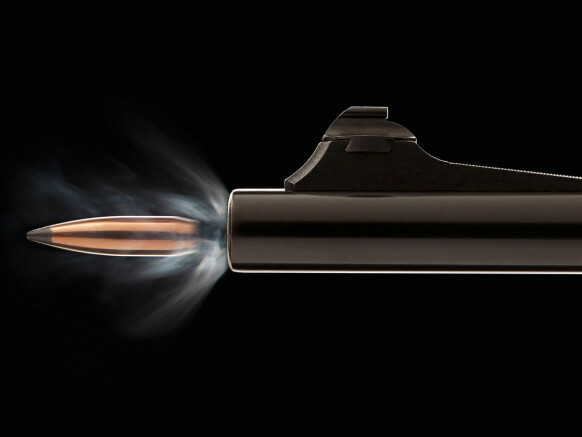 C13AR6 Studio shot of bullet coming out of gun barrel. Image shot 2010. Exact date unknown. Recently came out this nice article on the ballistic pendulum by Rhett Allain, associate professor at Southeastern Louisiana University. In case you would not know, a ballistic pendulum is a device that uses mechanics to measure the momentum and velocity of a projectile like…a bullet. If you don’t like fire arms, fair enough, this is also how punch machines work in most fun fairs!! What is nice is that it relies on the very profound principles of mechanics that we are learning right now in the school of Math & Physics. So if you want to learn more about what can the mechanics you are learning be used for, do not hesitate to have a read.